The Zeonic Geofront: Clips of the Tron Daft Punk Score Have Gone Live!! Clips of the Tron Daft Punk Score Have Gone Live!! I love Tron. 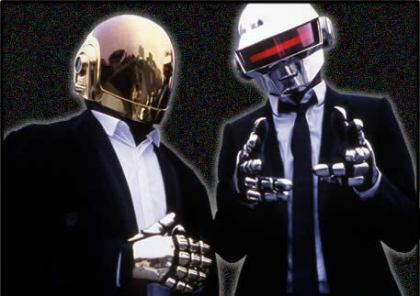 I love Daft Punk. I though from the moment I heard the announcement that they were the perfect choice to score this film. "Intern Bryce" at 107.7 in Seattle has somehow gotten a hold of six one minute clips from their new score. As a fan I can say it's not what I expected. It does sound very much more generic-movie-score-ish than I thought it would be. That said, I like where it's going. It very much reminds me of Vangelis' score for Bladerunner mixed with Hans Zimmer's Dark Knight score. Very tense. Lots of rolling strings. Don't get me wrong, but I'm still really excited, and will probably pre-order the album once it's available. I now know what to expect though. This will not be a live action Intastella 5555. This is obviously the first entry into their resumes in hopes of getting more movie work. Frankly who else would you want to score a Sci Fi movie?